Moisson, France, 1947. The Sixth Jamboree. " 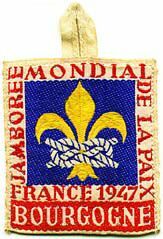 Jamboree of Peace". 24,152 Scouts. Ten years since the previous Jamboree. B-P no longer with us. "Cousins" of previous Jamborees became "Zs" here. Loudspeakers an unpleasant innovation of the times. "Le Train" brought from the Maginot line to be used at the Jamboree. Indian Scouts celebrate their country´s independence. "Challenges" were part of Moisson. The boyish "dares" are part of the largely unrecorded life of all jamborees. The final march, along the pattern of a carrick bend, symbol of the Jamboree. At the opening ceremony the Scouts had marched in by countries; at the closing ceremony each sub-camp was the unit, and bore at its head the many flags and banners of the Scouts of several countries who had been camping together.